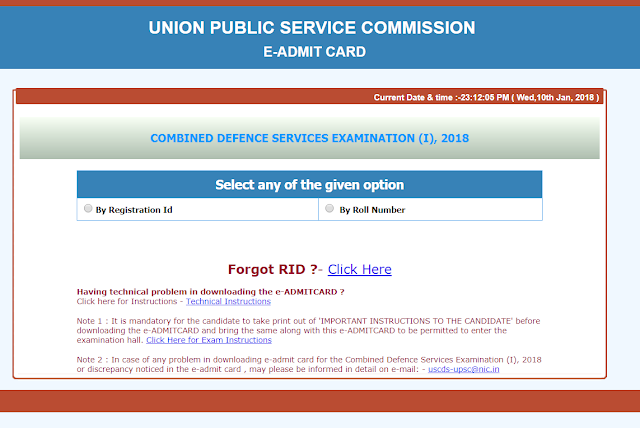 UPSC CDS I Admit Card 2018 – Download Call Letter, Hall Tickets for CDS examniation and check the Important Instructions you need to remember before entering UPSC CDS Examination hall. UPSC CDS I Admit Card - UPSC CDS I Admit Card 2018 is out on the official website. The candidates can download the admit card FROM the official website of UPSC. cds applicant can log in by entering the Registration Number and DOB (Date of Birth). UPSC CDS I 2018, which is going to be conducted on 4th February 2017 will need an admit card for the admission inside the Examination hall.CDS Admit Card Download - Union Public Service Commission(UPSC) has released CDS I Admit Card 2018 of its Combined Defence Services Examination (I), 2018 Examination.